Seabury Hall’s Alyssa Bettendorf is qualified in the girls 100, 200, 400 and long jump today. File photo by Rodney S. Yap. 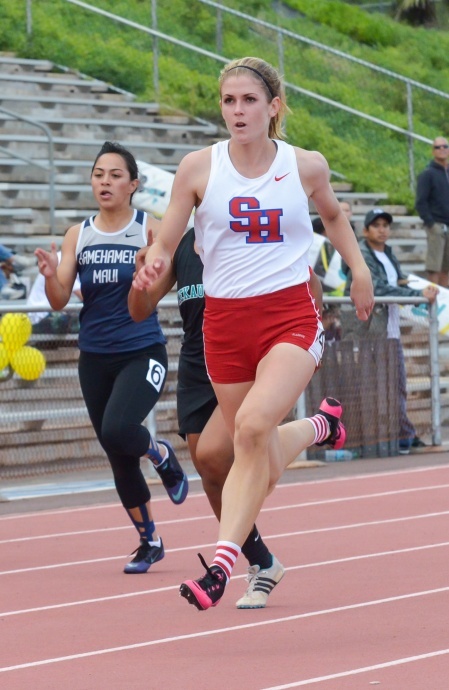 The Seabury Hall girls track team set the table in Friday’s trials in hopes of serving up a historic victory tonight at the 2014 Island Movers Hawaii State Track & Field Championships. Today’s finals action at Kamehameha Oahu’s Kapalama Campus starts with the boys discus at 2:30 p.m. 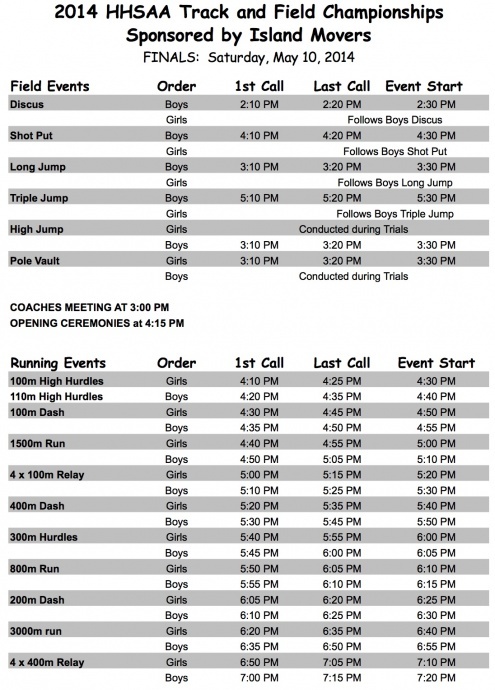 The long jump, girls pole vault and boys high jump starts at 3:30 p.m. The first running event, the girls 100 high hurdles, is at 4:30 p.m. 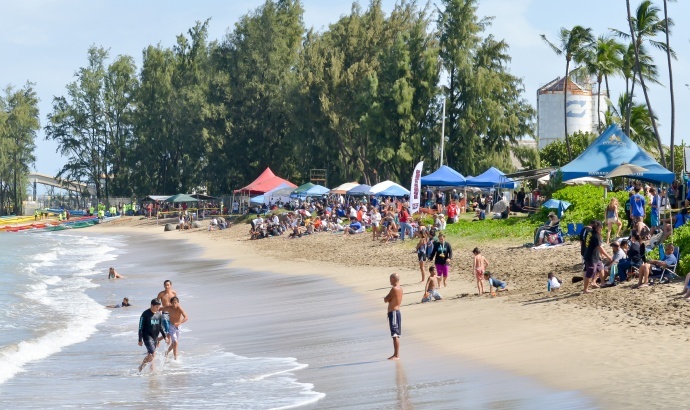 The finals can be seen live on OC16 TV, starting at 4 p.m. through 7:30 p.m. Maui’s Jordan Helle will be a part of the broadcast team for OC16. Seabury Hall is the girls favorite with arguably the best 1-2 combination in the history of the sport with sprinter/jumper Alyssa Bettendorf and mid-distance/distance runner Dakota Grossman. The two seniors could combine for more than 50 points if things go well for them in their respective events — that’s not including the 10 points they could get in the meet’s final event, the 4 x 400 relay, or the 10 points the Spartans have already picked up from sophomore high jumper Amy Ozee, who finished tied with three others for first place in the girls high jump at 5 foot, 2 inches. 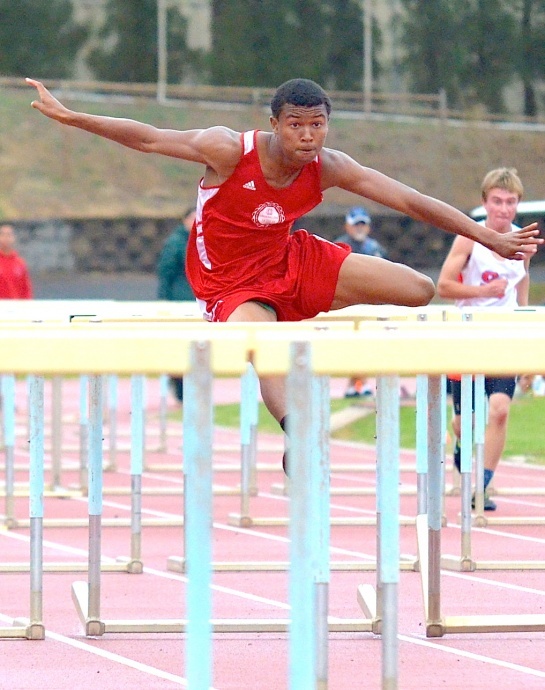 Lahainaluna High School hurdler Emerson Liburd is the states top qualifier in the boys 110 high hurdles. File photo by Rodney S. Yap. Finals for the girls high jump and the boys pole vault were held Friday. Punahou, Seabury’s nemeses and the girls division powerhouse with 35 titles to its credit, including nine of the last 10, did not score in the high jump event. Things also started well for two-time defending boys champion Baldwin as the Bears had two pole vaulters — Kainoa Tom and Dusty Flores — finished tied with two others for first place in the boys vault at 14-0. St. Anthony’s Christopher Rickard finished in a three-way tie for fifth place at 13-6. Officials had the vaulters jump-off to decide the place finishes since they each had the same number of misses and Tom eventually beat runner-up Flores, clearing 13-9. According to a Maui News report, Flores bowed out and did not take his last attempt after injuring his back on his previous try. The Bears 1-2 finish is in the vault is worth 18 points. Bettendorf and Grossman handled their business like veterans and the senior captains they are. Bettendorf qualified for the finals in all four of her individual events, the 100, 200, 400 and long jump, while Grossman did the same in the 1,500, 800, and 3,000. The two were later joined with Kiana Smith and Christy Fell to post the top 4 x 400 relay time in 4 minutes, 2.78 seconds. Although there were some occasional showers Friday, there was very little wind, making for extremely humid conditions. More of the same is expected today, testing the minds and the bodies of the athletes competing. Rest will be critical for individuals like Bettendorf and Grossman who are doing multiple events with less than 24 hours rest. No MIL girls team team has ever won a state track title. Last year, Punahou squeezed by the Spartans 69-68 at Mililani High School, and two years ago on Maui the Buffanblu edged Seabury 66.33 to 64. Tonight’s outcome in the girls division figures to be close again making every point count. In all, 32 MIL athletes advanced to the finals. The MIL’s top seeds based on the Friday’s trials are Kamehameha Maui’s Kauanoe Vanderpoel in the boys discus (152-7) and shot put (52-4.5); Baldwin’s Ricky Casco in the boys long jump (21-4); Baldwin freshman Kaitlin Smith in the girls long jump (17-5.25); Lahainaluna’s Emerson Liburd in the boys 110 high hurdles (14.86); Bettendorf in the the girls 100 (12.53); Seabury’s Ally Smith in the girls 1,500 (5:01.10); and Seabury’s Daniel Pietsch in the boys 400 (49.78). King Kekaulike’s Jay Braun is in position to possibly win three gold medals should things go his way in the 100, 200 and the team’s 4 x 100 relay. Teammate Jake Jacobs, the defending champion in the boys 400, scratched from the event Friday and ran the second fastest qualifying time in the boys 800 (2:01.17). Leha, KAIM, FOUL. –, Sabrina Hollins, Waipahu, FOUL. Lucas Beddow, KS Kapalama, 47-06, AUTO. 12, Feke Kioa, Kealakehe, 47-01, CONS. 13, James Roy, Damien, 46-11.50, CONS. 14, Dustin Liva, Keaau, 46-10.50, CONS. Punahou, 42-01. 32, Matthew Simpkins, Keaau, 39-05.50. 15-11, CONS, w:NWI. 13, Tiyana Hallums, KS Kapalama, 15-08.50, CONS, w:NWI. Girls, 14-09, w:NWI. 27, Kailana Kaeo, Mililani, 14-08, w:NWI. Kekaulike, 31-03.50, w:NWI. 32, Amy Ozee, Seabury, 31-01, w:NWI. Calilao, Maui High, 17.90, w:NWI. 25, Kiana Thomas, Kapolei, 18.30, w:NWI. CONS, w:NWI. 17, Nainoa-Kaukahi Soto-Thompson, Campbell, 16.15, CONS, w:NWI. Louis, 18.21, w:NWI. 30, Phil Aganus, KS Hawaii, 22.46, w:NWI. 11.14Q, AUTO, w:NWI. 3, Randolph Braun, King Kekaulike, 11.16Q, CONS, w:NWI. Waimea, 11.42, CONS, w:NWI. 14, Izaiah Lavatai, Radford, 11.44, CONS, w:NWI. kaiser, 11.69, w:NWI. 26, Destin Miguel, Waimea, 12.93, w:NWI. Thorbecke, LLHS, 4:22.21Q, CONS. 9, Kainalu Asam, KS Kapalama, 4:14.33q, AUTO. 51.90, CONS. 15, Waianae High School 52.11, CONS. 16, Kauai Girls 52.36, CONS. 55.00. 30, Kaimuki High School 55.07. School 46.59, CONS. 26, Hawaii Baptist Academy 47.03. 27, Seabury Hall 48.00. –, Kaimuki High School DQ. Keller, Mililani, 1:01.08, CONS. 12, Kawai Santiago, Punahou, 1:01.53, CONS. Singh, KS Maui, 50.78q, AUTO. 7, Kekoa Mundo, Christian Libert, 51.04q, AUTO. Reid III, Radford, 52.21, CONS. 14, Cohlby Roy Espaniola, Keaau, 52.31, CONS. Christian Devine, Radford, 53.25, CONS. 23, Igor Desuza, Saint Francis, 53.48. KS Hawaii, 48.60, CONS. 14, Mikiala Ramos Kamaka, KS Kapalama, 48.92, CONS. Iosua, Campbell, 52.24. 25, Ella Kotner, Hawaii Prep, 52.35. Soto-Thompson, Campbell, 41.02, AUTO. 10, Phil Aganus, KS Hawaii, 41.43, AUTO. 44.68. 31, Keith Sumaoang, Waiakea, 45.17. –, Carl Cedric Balon, Waipahu, DQ. Iolani Girls, 2:26.15, CONS. 10, Savannah Cochran, Hawaii Prep, 2:26.26, CONS. Amelia Warnock, Hilo, 2:32.63, CONS. 20, Cody Ching, Mililani, 2:33.00, CONS. Kriston Sasaki, MPI, 2:36.57. 24, April Laxamana, HBA, 2:37.60. Radford, 26.95q, CONS, w:NWI. 9, Shatres Ah Nee, Campbell, 26.95, CONS, w:NWI. Waianae, 27.54, CONS, w:NWI. 12, Anathena Tuppein, Konawaena, 27.73, w:NWI. 28.26, w:NWI. 15, Erin Moss, University High, 28.39, w:NWI. Grossman, Seabury, 11:01.30Q, AUTO. 5, Sol Kisig, St Joseph, 10:59.12Q, AUTO. Jac Hebert, Punahou, 9:40.93Q, CONS. 7, Ian McQuate, Waiakea, 9:27.24Q, AUTO. River Brown, Hilo, 9:50.10, CONS. 16, Nate Ladwig, Hawaii Prep, 9:50.38, CONS. Jacob Boros, Radford, 9:58.76, CONS. 23, Colin Kubota, Kailua, 9:59.97, CONS. Academy 4:37.60. 25, KS Hawaii 4:37.93. –, Moanalua High School DQ. Mililani High School 3:36.77, CONS. 14, Roosevelt High School 3:37.18, CONS. 15, kaiser high school 3:38.56, CONS. 16, Kalaheo High School 3:39.80, CONS. 3:42.64, CONS. 20, KS Hawaii 3:42.81, CONS. 21, Island School 3:43.98, CONS. Mid Pacific Institute DQ. –, Kealakehe DQ.